Started as a college student project, the project has now moved to the stage of software editor at the heart of an active open source ecosystem: team developers and pull-requesters on Github, beta testers, themes, plug-ins and mobile applications creators, translators, forum moderators, customers and users. Thank you all for being part of this great adventure! People like statistics so here they come: between 50k and 300k installations worldwide, 300k messages on forums, 320 plugins, 143 themes and 80 languages. The most significant challenge in the coming years is user experience. While Piwigo has top performance to manage high volume effectively, we regularly receive less positive feedback when it comes to aesthetics, ease of use and "first impressions". Unfortunately, this is an observation made by many similar open source projects. We had to accept that and roll up our sleeves. So we invested in design, thanks to Lisa, Samuel and Hannah, who designed mock-ups to improve things. Some have been integrated, such as the new sites piwigo.org and piwigo.com, others are still to be implemented, such as the new administration or the new skins for the Modus theme. I personally look forward to this graphic renewal so that the entire Piwigo community can benefit from it. Congrat! And many thanks for this great software. Don't worry the acne and blemishes will clear up with time. Keep going, I hope for many more years. 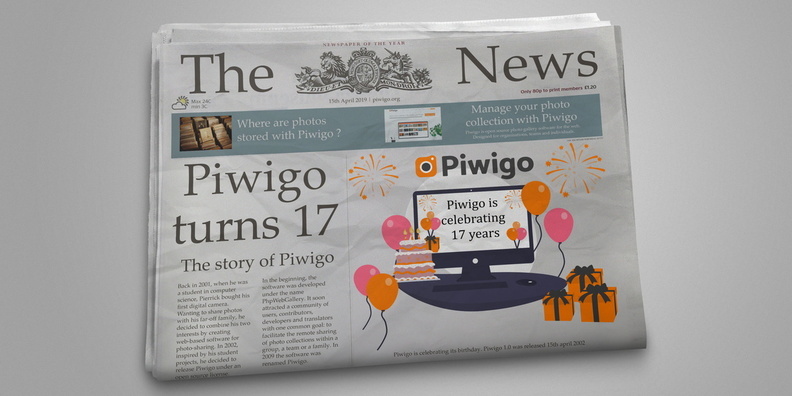 Dear Piwigo Team, Congratulations on the occasion of 15th birthday of Piwigo. Thanks for your excellent work. Congrats! I have two installations, one private and one for a photoclib. Thanks for this wonderful program. Happy Birthday. Thank you for providing an open source software that matches my budget on a fixed income. All the best to all contributors and authors! Thanks to everyone who has contributed your success!! !